When you decide to put on a German costume, everything should fit together - but especially match the Dirndl of your female company. Anyone who wants to traditionally wear a pair of Lederhosen must also think about an Oktoberfest shirt - otherwise a gentleman's Tracht does not fully work. In our shop, men will find a large selection of different Trachten shirts that they can buy affordably online to make an Oktoberfest outfit complete and celebrate properly in traditional style. Also for everyday wear our men's Oktoberfest shirts with their fashionable cut and the different color variations are perfect. With our beautiful Trachten shirts you are well dressed for any occasion, whether at a wedding, at the folk festival or for work. 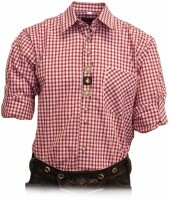 If you are looking for a Trachten shirt that is fashionable, looks great with a pair of Lederhosen and also affordable, then you've come to the right place. 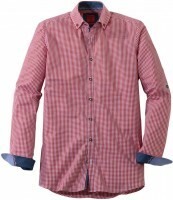 We offer unique models of men's shirts in different colors and sizes, so that every Trachten fan will find the right one and is always well dressed. The original Trachten shirts in Germany and Austria were originally just white, made of linen or cotton and decorated with staghorn buttons. They served as a holiday robe for special occasions or were worn to church on Sundays. Most Lederhosen wearers used rugged plaid shirts in red or blue for work, because they were less delicate and didn’t become dirty easily. 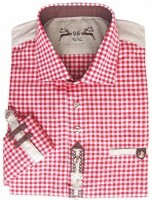 Today you’ll find different variants, both white and checkered men's shirts in the traditional German look. 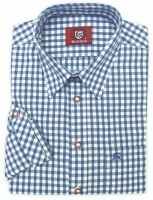 Especially men between the ages of 20 and 40 often prefer plaid models to white, classic shirts. 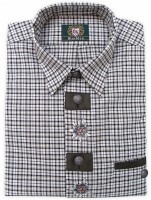 Their buttons are often held in traditional German costume optic, e.g. 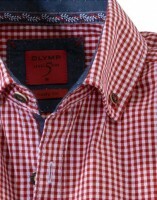 in staghorn style, which are sewn onto the button placket and on the cuffs, so that each shirt is a unique and fashionable model. Color-wise we also offer a wide selection for every taste. 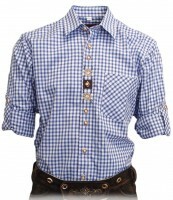 We carry Oktoberfest shirts in the colors light blue, dark green, brown and burgundy. These colors are more traditional. 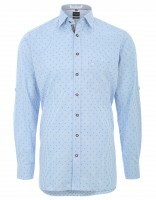 Fashionable gentlemen can order shirts in apple green, purple and berry tones. All our models can be wonderfully combined with black or brown leather pants and provide a coherent overall appearance of a German costume. Even though many Lederhosen fans are now wearing their pants in everyday life and would rather combine them with a casual T-shirt - for a proper, flattering Oktoberfest costume, men should choose a matching traditional shirt. With us you will find numerous affordable men's shirts in traditional look, which work wonderfully with Lederhosen, are easy to care for and fashionable at the same time. 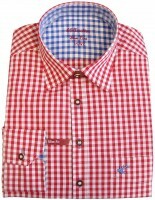 Especially for events such as weddings or the Oktoberfest men should leave the T-shirt in the closet and treat themselves to a nice Trachten shirt. Browse through our online shop for stylish models and order conveniently and easily from home. We deliver within just a few days of order, so that nothing stands in the way of a nice party in a traditional Oktoberfest outfit. 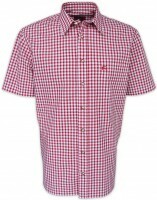 And the best thing is that our checkered shirts don’t only work as part of a traditional costume. They also look great with jeans, so you can wear them in your everyday life or at the office. With one of our models you are always well dressed and make a good figure on every occasion. 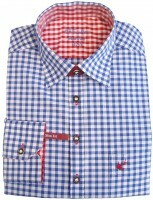 At the unbeatable prices in our shop it is worth ordering a stylish men's shirt in several colors. That’s how you’ll have a guaranteed variety in your closet and are well prepared for any occasion.